Home / Opinion / Atty. 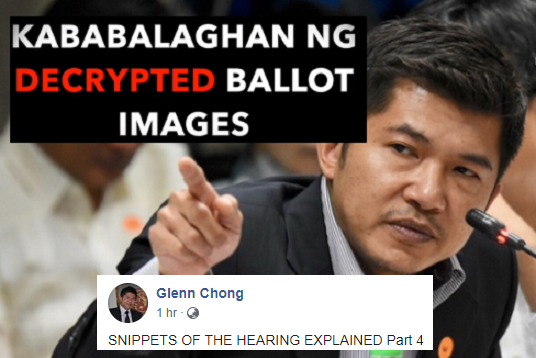 Glenn Chong's Snippets of the Hearing PART 4: "Kababalaghan ng DECRYPTED Ballot Images"
Atty. Glenn Chong's Snippets of the Hearing PART 4: "Kababalaghan ng DECRYPTED Ballot Images"
After the Senate hearing last Tuesday, July 31, 2018 for allegedly 2016 fraudulent elections, many have expressed surprising revelations and evidences to prove that there has been anomalies in the previous national elections. Senator Aquilino Pimentel III, chairman of the Senate Committee on Electoral Reforms and People's Participation and Senate President Vicente Sotto III, led the hearing and questioning of officials on the Commission on Elections (Comelec) officials, but apparently, clarifications for the issues of fraud remain unanswered as of this writing. During the senate hearing, former Biliran representative and election lawyer Glenn Chong reveals the alleged fraud in the 2016 elections. Various reactions have surfaced from opposing parties, and there has been a release that the video of the hearing has been ceased to serve as proof of anomalies. However, for Atty. Glenn Chong, the fight will not stop him from proving that there has been an outburst, so that those alleged offenders who steal the votes of the people will pay. Thus, since that day of the hearing, Atty. 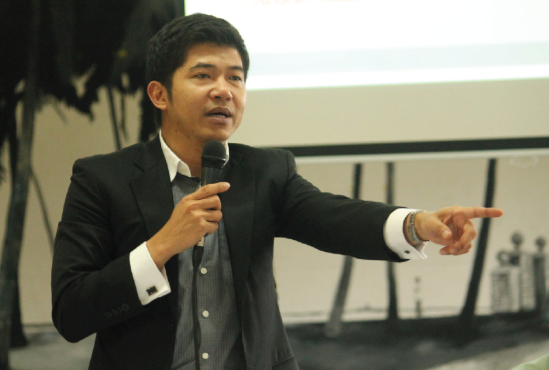 Chong posted several exposés on his Facebook account that are being followed and monitored by many netizens, since it has been said that most essential issues that has been discussed and displayed amid the Senate investigation was not circulated nor covered by known Media outlets in the nation. He then made a part by part brief summary of his evidences for people to see beyond the reality that there is indeed an election anomaly happened last 2016. The latest of which was the Part 4 of his "SNIPPETS OF THE HEARING" that tackled about the purportedly missing ballot images. According to Atty. Chong, the day before the Senate hearing on Tuesday, Leni Robredo's camp suggested that ballot images or pictures of ballots taken by the machine be used to speed up the protest. However, as per the election lawyer, there is a huge difference between the original ballot and the ballot image taken by the machine and worse, in the list of ballot images recorded by the machine, there are ballot images missing in the front and middle part. Likewise, Atty. Chong pronounced that is easier to erase and replace ballot images because it is only within the SD cards held by the Comelec and if ever, they will be the only ones capable of doing so. Thus, It is easier to perform this operation than ballot boxes. He then ended his post by saying that this already happened in 2013 and was just repeated in 2016. Yet, there was no answer from the Comelec regarding the said issue. "SNIPPETS OF THE HEARING EXPLAINED Part 4"
Isang araw bago ang hearing ng Senado noong Martes, iminungkahi ng kampo ni Leni Robredo na gamitin na lamang ang mga ballot images o larawan ng mga balotang kinuha ng makina upang mapabilis diumano ang protesta. Delikado ito. Sa hearing, inilabas ko ang malaking pagkakaiba ng orihinal na balota at ang ballot image na kinuha ng makina. Worse, sa listahan ng mga ballot images na itinala ng makina, may mga ballot images na nawawala sa unahan at gitnang bahagi. Sa Precinct No. 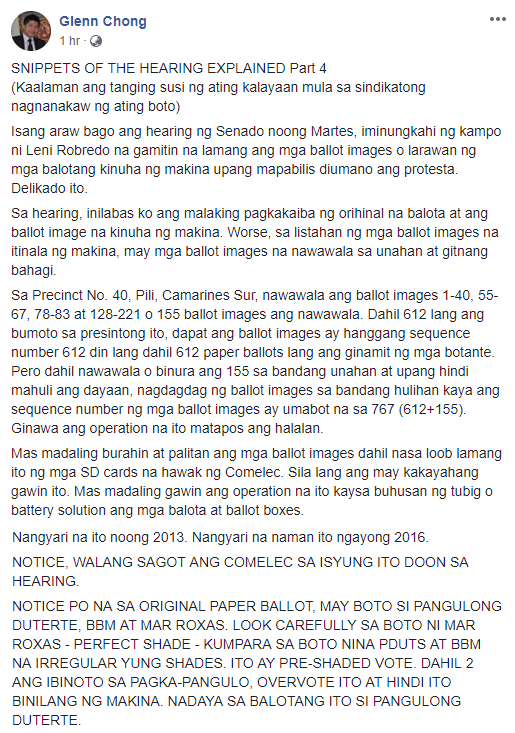 40, Pili, Camarines Sur, nawawala ang ballot images 1-40, 55-67, 78-83 at 128-221 o 155 ballot images ang nawawala. Dahil 612 lang ang bumoto sa presintong ito, dapat ang ballot images ay hanggang sequence number 612 din lang dahil 612 paper ballots lang ang ginamit ng mga botante. Pero dahil nawawala o binura ang 155 sa bandang unahan at upang hindi mahuli ang dayaan, nagdagdag ng ballot images sa bandang hulihan kaya ang sequence number ng mga ballot images ay umabot na sa 767 (612+155). Ginawa ang operation na ito matapos ang halalan. Mas madaling burahin at palitan ang mga ballot images dahil nasa loob lamang ito ng mga SD cards na hawak ng Comelec. Sila lang ang may kakayahang gawin ito. Mas madaling gawin ang operation na ito kaysa buhusan ng tubig o battery solution ang mga balota at ballot boxes. Nangyari na ito noong 2013. Nangyari na naman ito ngayong 2016. NOTICE, WALANG SAGOT ANG COMELEC SA ISYUNG ITO DOON SA HEARING. NOTICE PO NA SA ORIGINAL PAPER BALLOT, MAY BOTO SI PANGULONG DUTERTE, BBM AT MAR ROXAS. LOOK CAREFULLY SA BOTO NI MAR ROXAS - PERFECT SHADE - KUMPARA SA BOTO NINA PDUTS AT BBM NA IRREGULAR YUNG SHADES. ITO AY PRE-SHADED VOTE. DAHIL 2 ANG IBINOTO SA PAGKA-PANGULO, OVERVOTE ITO AT HINDI ITO BINILANG NG MAKINA. NADAYA SA BALOTANG ITO SI PANGULONG DUTERTE."